Fr. Rutler on NYC Church Closings: The ‘aggiornamento’ of Vatican II was supposed to bring in tons more people; it did just the opposite. Father Rutler discusses spiritual realities behind the decision to close 55 churches!! Catholics in dozens of parishes in New York City and several other counties that make up the Archdiocese of New York learned the sad news that the church where they have been worshiping will be closing. As part of a major reorganization, Cardinal Timothy Dolan announced the results of a study aimed at saving badly-needed funds and shifting churches and priests to areas outside the city where the Catholic population is growing. One well-known parish that was spared the axe is the midtown Manhattan Church of the Holy Innocents, a traditionally built church that has attracted a large crowd of traditional Catholics over the past few years. It is the only Catholic church in New York City that offers a daily Mass in the Extraordinary Form of the Latin Rite, also known as the Tridentine Mass. Father George Rutler is administrator of both Holy Innocents and the West Side Church of St. Michael, which also was passed over by the reorganization plan. Father Rutler, author of Principalities and Powers: Spiritual Combat 1942-1943, and other works, spoke with Aleteia this morning about spiritual issues in the background of the archdiocesan reorganization. Obviously, church/parish closings/mergers are not a new phenomenon, but in your view, what are some of the factors that lead to situations like this? Among the factors is a decline in Catholic life. One statistic I was given recently is the Catholic population of New York City is just about the same as it was 70 years ago. There’s not a decline in Catholic population; there’s a decline in Catholic life, and there are all kinds of reasons for that. I think there’s a great deal of dishonesty and denial on the part of some people who engaged in the fantasy that we were entering a new springtime of the faith. 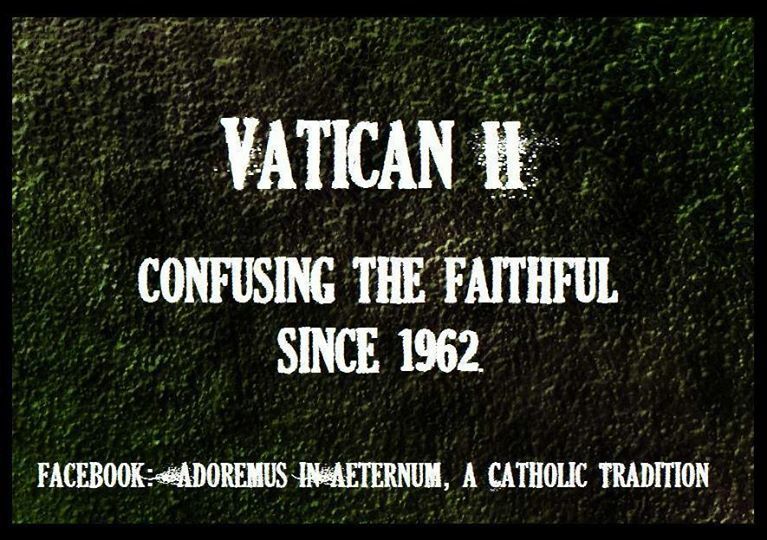 The aggiornamento of Vatican II was supposed to bring in tons more people; it did just the opposite. So long as people refuse to admit there were mistakes made a generation ago — in catechesis, liturgy, addressing the real problems of secularism — they’re never going to make any real reform. We’ve also had a lot of white flight from the city out to the suburbs, and in the northern counties there is a need for new parishes. At the same time, down here, we do have…redundant parishes. Another reason for these closures is that the churches were organized very much for ethnic purposes rather than evangelical purposes. There was a cultural assumption that the Church was a home for immigrants, and that they would belong to parishes not just for the faith but also for, legitimately, social reasons, for community, schools and the like. So in Manhattan we have an old German parish, an Italian parish, [etc. ], and they’re in close proximity with each other. And, and that’s no longer needed. The primary fact is that most Catholics aren’t practicing the faith. Mass attendance in New York is about 12%. You’ve had about a 50% drop since the Second Vatican Council. Nobody will address that. They’ll acknowledge the fact, but they will not address the fact that there were some serious mistakes made in the last generation. It would make a good study on why New York City, which is so culturally vibrant — sort of tormented and perverse in many ways, but vibran t— has such spiritual lethargy. The other factor, of course, is the priest shortage. It’s a curiosity that here we are in New York City, the heart of the universe — I say that as a New Yorker — we have such a low number of priestly vocations. In my last parish, where I was for 12 years, I had nine fellows go on to the seminary. When asked “How is it done?” I tell them, and some don’t want to hear it. I think it’s significant now that more young men are going into religious orders rather than the diocesan priesthood. Of course they are distinct kinds of ministries but I think some of them go into religious orders who might have gone into the secular priesthood, because the local scene often seems banal. The religious orders often are more challenging. What are we not doing that we should be doing to revive Catholic life? The first thing is to be realistic, to address the real problems in our society, secularity, instead of trying to be everything to everyone. It’s a great danger just to want to be friendly and liked instead of challenging in a prophetic way the errors of society and caving into them. St. Paul said to Timothy, “Do not be a man-pleaser.” This doesn’t mean going around and hitting people over the heads with bibles, but it does mean being Catholic, right across the board…. We’ve had a secularization of religious life. Women’s religious orders are collapsing, have collapsed. Nothing was done a generation ago to discipline the orders, and to truly reform them. The ones that are growing are the ones who are faithful to their founders’ charisms. And a primary evangelical tool of the Church is the liturgy, and wherever the liturgy is banal, you will not have vocations. In many places it’s not a problem of heresy, it’s just a matter of sloth. People are just stuck in the 1970s. Young people don’t want to go to a church where there’s a septuagenarian playing very bad Jesuit hymns from the 1960s. But many bishops don’t understand that. The liturgy has become just sort of man-focused. One giveaway is liturgies where the bishop or the priest cannot restrain himself from interjecting his own personality. They were taught to do this: greeting people, telling jokes and then thanking everybody for being there, and at the end asking applause for the choir and the ushers and everybody else. We don’t thank people for keeping the commandments! These are commandments, not propositions. That’s people’s main contact, and I would say my vocations more than anything else came from young men’s absorption in the liturgy. And I’m not speaking about being fussy or obscurantist. I think there’s a real problem of reaction from evangelization, a real problem of nostalgia rather than tradition on the part of many people as far as the Extraordinary Form is concerned. But that’s to be expected when people have been denied their authentic Catholic roots. The danger then, of course, is…to become enclosed. Cardinal Ratzinger spoke about the danger of Mass facing the people as a kind of enclosure, whereas when the priest leads the people facing East it’s an opening to the kingdom of God. The priest facing the people becomes a kind of circular community lacking in transcendence. But a lot of people who embrace the Extraordinary Form run that risk too.They become ghettoized. It’s rather significant that in so many cases — I can’t cite numbers — but usually it’s been my experience that where the Extraordinary Form is, usually you have a static group of people, and you don’t have outreach for bringing others in. So just using the Extraordinary Form is not the solution. What is the solution is understanding that the liturgy is God’s call to the people and the people’s response. Then you get vocations. Another factor is the preaching, which is abysmal. We need catechetical preaching, where people get the basic doctrine of the faith. People should be leaving church having learned something. Meanwhile… New York’s St. Patrick’s Cathedral to Undergo $177-Million-Dollar Renovation!! NEW YORK — New York City’s fabled St. Patrick’s Cathedral has been a silent, noble observer of the St. Patrick’s Day parade for over a century. But, according to New York’s new cardinal, the old cathedral is in danger of disintegrating. Just prior to the Fifth Avenue parade celebrations on March 17, on the steps of the cathedral — on the feast day of St. Patrick himself — Cardinal Timothy Dolan announced that the Archdiocese of New York is launching a $177-million renovation of the cathedral. Hailed by Cardinal Dolan as “America’s Parish Church,” the cathedral will undergo its largest and most expensive restoration since it first opened its doors 133 years ago. Construction of the church began in 1858, when then-Archbishop John Hughes decided that the Catholic community of New York, primarily comprised of Irish immigrants, had outgrown the former St. Patrick’s Cathedral (now the Basilica of Old St. Patrick’s Cathedral) located on Mulberry Street in Lower Manhattan. A new location, where the cathedral now stands, was chosen on Fifth Avenue between 50th and 51st Streets in Midtown Manhattan. The construction had hardly begun when it was halted due to the Civil War. Twenty years later, in 1879, the first Mass was celebrated inside the cathedral. 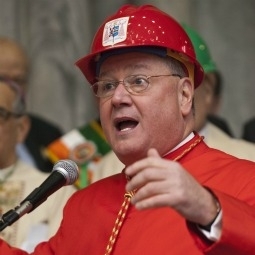 Now, 14 decades after John Hughes first dreamed of a new cathedral for the city of New York, Cardinal Dolan is calling on New Yorkers — Catholics and others of good will — to once again support the cathedral, which, according to the cardinal, is in great need of both repair and reinforcement to safely welcome the more than 5.5 million visitors it receives each year. During the morning press conference, Cardinal Dolan was joined by New York Gov. Andrew Cuomo and other state and city officials as he summarized the history of the cathedral and bluntly described the physical needs that have brought about the restoration campaign. Over the next three years, the archdiocese will attempt to raise the necessary funds to complete the full restoration. The total price tag of the project is estimated at $177,300,000 — of which $55 million for the initial stage has already been secured through the cathedral trustees and a grant from the archdiocese. St. Patrick’s Cathedral trustee Ken Langone told CNBC that some wealthy Catholics were balking at giving their financial support to the New York church’s restoration project in the wake of the pontiff’s teachings!! Pope Francis’ recent critical comments about the wealthy are potentially scaring off millionaire donors for the $180 million restoration of St. Patrick’s Cathedral. That’s the message that billionaire Ken Langone, founder of Home Depot, passed along to Timothy Cardinal Dolan during a recent breakfast meeting. Langone, who’s spearheading the restoration of St. Patrick’s, told CNBC on Monday that some wealthy Catholics were balking at giving their financial support to the project in the wake of the Pope’s teachings. He said one “seven-figure potential donor” to the project was hesitant to give because of comments the new Pope made in his November exhortation. “Money must serve, not rule!” the pontiff wrote, taking aim at the new “idolatry” of money. U.S. Archbishops seem to live the “lifestyles of the rich and religious!! U.S. Archbishops seem to live the “lifestyles of the rich and religious,” and some people say it is not justified, while bishops say the buildings are historical and can’t easily be sold. According to church and government records, 10 of the 34 active archbishops in the U.S. are living in buildings worth more than $1 million. New York’s Cardinal Timothy Dolan was recorded as owning the most expensive property with a 15,000-square-foot (1,394 square meters) mansion on Madison Avenue. Vanderbilt Appraisal Company estimated the mansion’s value at $30 million. Cardinal Francis George of Chicago owns a mansion located on 1.7 acres of prime real estate in Chicago. The three nuns who work for the cardinal live in a 5,800-sqaure-foor coach house near the mansion.